Cornwall-based surfers are holding a competition this year in a Sri Lankan resort hit by the Asian tsunami. About 20 top surfers will be travelling to Aragum Bay on the east coast of Sri Lanka for the contest from 13-23 June after an invitation from locals. 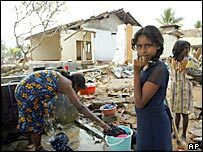 Thousands of people were killed at Sri Lankan resorts when massive waves hit the island in December. The British Surfing Association is also holding a fund-raising competition at Newquay, Cornwall on 9 April. Former British champion Lee Bartlett, who competed at Aragum Bay in a BSA event last year, said the aim was to raise awareness of the resort. Mr Bartlett, from Truro in Cornwall, said: "Aid is a short term fix, but the long-term aim is to get people to go back on holiday there. "Tourism is a lifeline for them and this contest will hopefully encourage that. "Aragum Bay showed us so much hospitality last year, we are hoping to put something back." Non-surfers would also be welcome at the Fistral event, Tsunami Surf Relief UK, which is being organised by the Cornwall-based BSA. He said: "It's not just for surfers, it's for everybody. "Even if it's your first experience surfing, it's going to last a lifetime - and it's going to mean a lot to the people out there in Sri Lanka."